I’ve got some amazing waffle recipes for you! I’ve discovered a fabulous vintage cookbook that has the best waffles I’ve made and I hope you’ll enjoy them too. 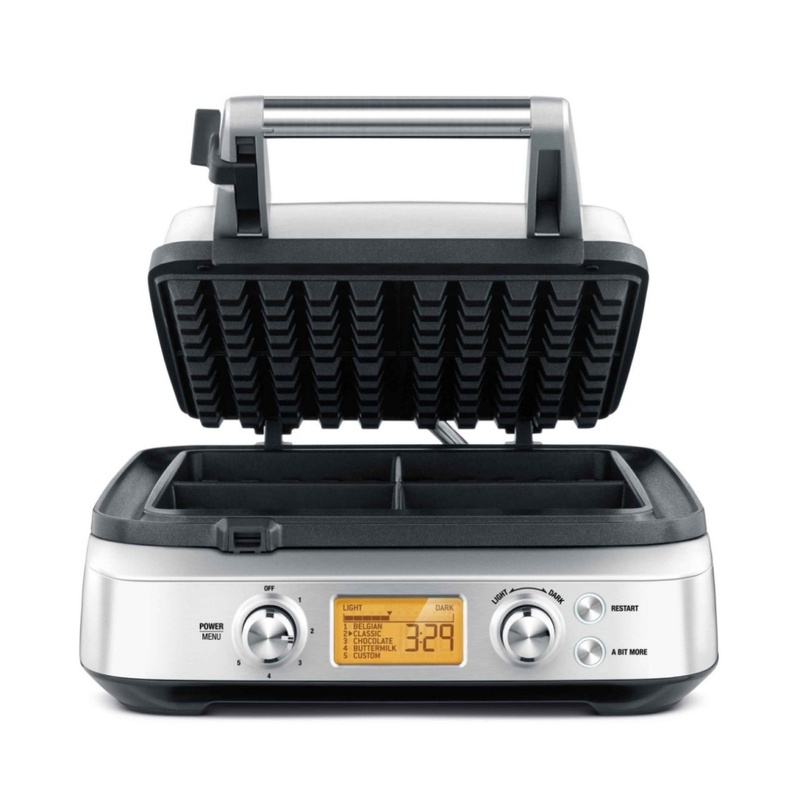 I’ve recently had the pleasure to review two types of waffles makers from Breville Canada. The first one I adore for big groups or when we have friends when family visits over for brunch. It’s the Smart Waffle 4 piece. Easy to clean up, 5 settings to choose from which are: Classic. Belgium, Chocolate, Buttermilk and Custom. With this, I made a kid classic. Banana Walnut Waffles and served my kiddo’s freshly squeezed orange juice blended with banana. A nice weekend treat. Sift flour again and with baking powder, sugar, salt and soda into a bowl. Stir in nuts and orange peel. Beat egg yolks with buttermilk, oil, and mashed bananas: blend with dry ingredients. Whip egg whites until they hold peaks, and fold them into the batter. Bake on preheated waffle griddle until medium brown. Serve topped with sliced bananas, melted butter and syrup. Thinking of a more savoury dinner type of waffle to use with the Smart Waffle 4 piece waffle maker? Sift flour again with baking powder, soda and salt. Add the caraway seed. Mix beaten eggs, sour cream, milk and salad oil. Blend with dry ingredients until mixed. Bake in your waffle maker on a lower setting. Keep warm in the oven before serving at 200F. Saute mushrooms and parsley in butter until mushrooms are cooked. Sprinkle caraway seed and salt. Stir in shrimp. Heat through. Stir in sour cream(and sherry if desired) and heat until just heated through. Serve on top of waffles. I love this little waffle maker. It doesn’t take up too much room and it’s perfect for little hands to grab thanks to the size of the triangular waffles. I use this the most and the settings are great for that perfect waffle. 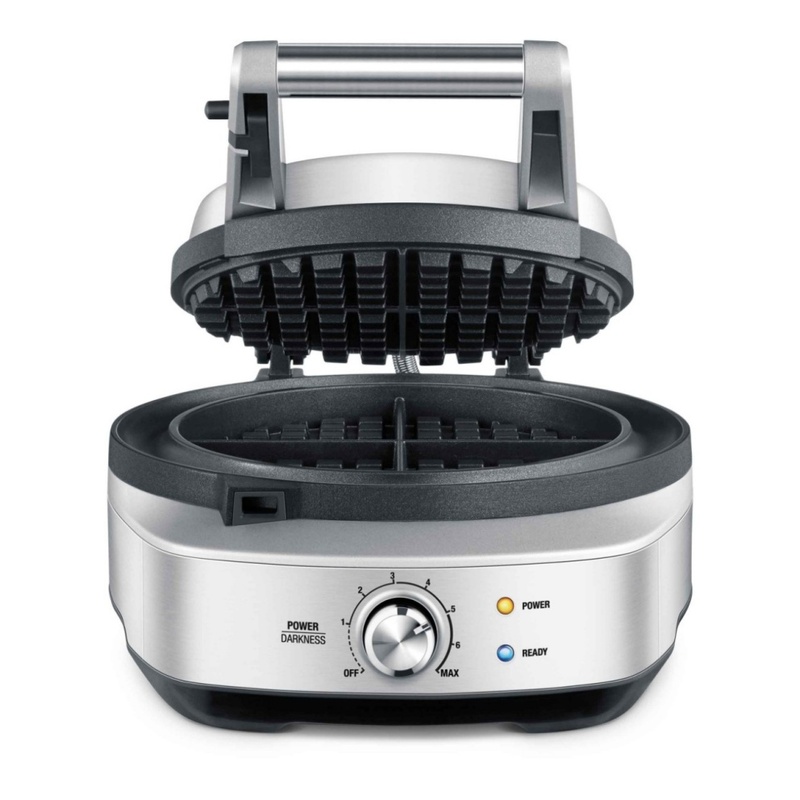 It’s called The No Mess Waffle maker and I sure hope Santa will have one under the tree for you! Priced at $199.99. If you’re looking for a wonderful Christmas morning waffle to make let me tell you about the Gingerbread Waffle pictured above. Your home will smell heavenly! Poached sweetened apples or applesauce makes a nice accompaniment. Cream together the butter and brown sugar. Beat in the molasses and egg yolks and milk. Sift flour again with baking powder, cinnamon, ginger, cloves and salt. Beat egg whites until soft peaks form. Stir in dry ingredients into creamed mixture then fold the beaten egg whites. Pour batter into the waffle maker and set to your preference. Using an electric mixer beat 3 eggs with 1 cup of sugar until thick and pale yellow. Beat in 1/4 cup of lemon juice, 1 teaspoon of grated lemon peel, dash of salt and 2 tablespoons of butter. Pour into top of double boiler and cook, stirring over simmering water about 15 minutes until mixture is slightly thickened and coats a spoon. Serve warm or cooled. Whip 1 cup of heavy cream with 2 teaspoons of sugar; fold in 2 tablespoons finely chopped crystallized ginger. Never buy frozen again with this recipe! If you’d like to skip buying prepared waffles you can make your own with this recipe. I just pop them in the toaster. Super easy, super yummy and great for a quick breakfast. Sift flour again with baking powder, salt and sugar. Beat egg yolks with cream and melted butter. Mix into dry ingredients. Beat egg whites until stiff, but not dry and fold them in. Bake in your waffle maker. Beat 1/2 cup of butter until creamy and gradually beat in 1/4 cup honey. Spoon into a bowl. So these are my favourite waffle recipes. 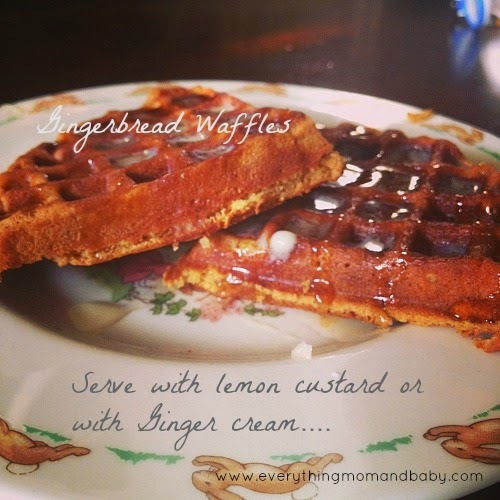 I think you’ll enjoy them all and with Christmas around the corner, I hope you’ll make the Gingerbread waffle. Kids love them. This post was written in collaboration with Breville Canada. All opinions are always my own. I’d love to see the Custom Loaf breadmaker be featured. I would like to see the custom loaf breadmaker featured. Would love to see the sandwich maker feature. Mm! I love plain buttermilk waffles topped with syrup. The Smart Oven would be very cool for you to feature. I would like to see the Barista express. The other products I like are The Smart Oven, The YouBrew and The Quick Touch Microwave. I love this recipe! I tried it and am now entering. 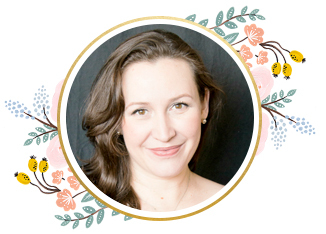 I’d love to see you review the Pizza Maker! Congrats Melaner! You won the Breville Waffle Maker. An email has been sent. Another Breville product I like is the Juice Fountain Plus. This Giveaway is no closed and over. Thank you everyone! I will announce a winner on Monday. The Rich Waffles sound like they would be my favourite, I am going to have to give these ones a try, along with the honey butter! !